a method for determining induced sensitivity (allergy) by applying an antigen (allergen) to, or inoculating it into, the skin; induced sensitivity (allergy) to the specific antigen is indicated by an inflammatory reaction of one of two general kinds: 1) immediate, appears in minutes and is dependent on circulating immunoglobulins (antibodies); 2) delayed, appears in 12-48 hours and is not dependent on these soluble substances but on cellular response and infiltration. A test for detecting an allergy or infectious disease, performed by means of a patch test, scratch test, or intracutaneous injection of an allergen or extract of the disease-causing organism. 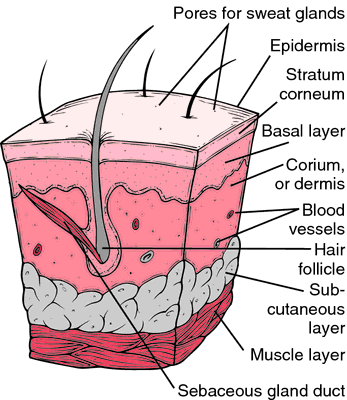 a test to determine the reaction of the body to a substance by observing the results of injecting the substance intradermally or of applying it topically to the skin. Skin tests are used to detect allergens, to determine immunity, and to diagnose disease. Kinds of skin tests include patch test, Schick test, and tuberculin test. 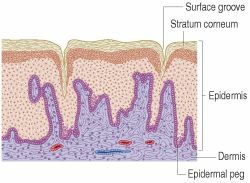 A test of an allergic response to a substance by placing it on (patch test) or just barely under (prick test) the skin. Immunology A test of immune response to a substance by placing it on or under the skin. See PPD, Prick test. A method for determining induced sensitivity (allergy) by applying an antigen (allergen) to, or inoculating it into, the skin; induced sensitivity (allergy) to the specific antigen is indicated by an inflammatory reaction of one of two general kinds: 1) immediate, appears in minutes to an hour or so and in general is dependent on circulating immunoglobulins (antibodies); 2) delayed, appears in 12-48 hours and is not dependent on these soluble substances but on cellular response and infiltration. A method for determining induced sensitivity (allergy) by applying an antigen (allergen) to, or inoculating it into, the skin; induced sensitivity (allergy) to the specific antigen is indicated by an inflammatory reaction.